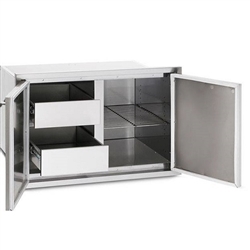 The LPA36 36" Sealed Pantry features two doors on the face secured with a magnetic gasket, which insures a tight seal. It has two slide out drawers and an adjustable wire shelf inside. The drawers are illuminated and includes a door lock.